The animation will take place with the help of CSS3 Transitions. The menu we will work on is black in color. On hover it becomes darker and a arrow appears above the menu text. 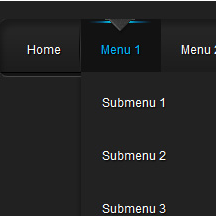 Live example of this menu can be seen by visiting the below link. Below are the 2 simple steps on how you can add this menu to your blogger blog.